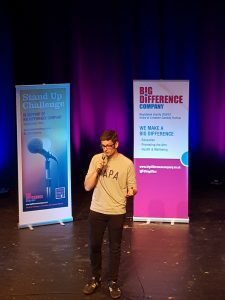 Serjeants’ senior associate and chartered patent and trade mark attorney, Tim Cadman, made his debut comedy performance at this year’s charity Leicester Stand Up Challenge. 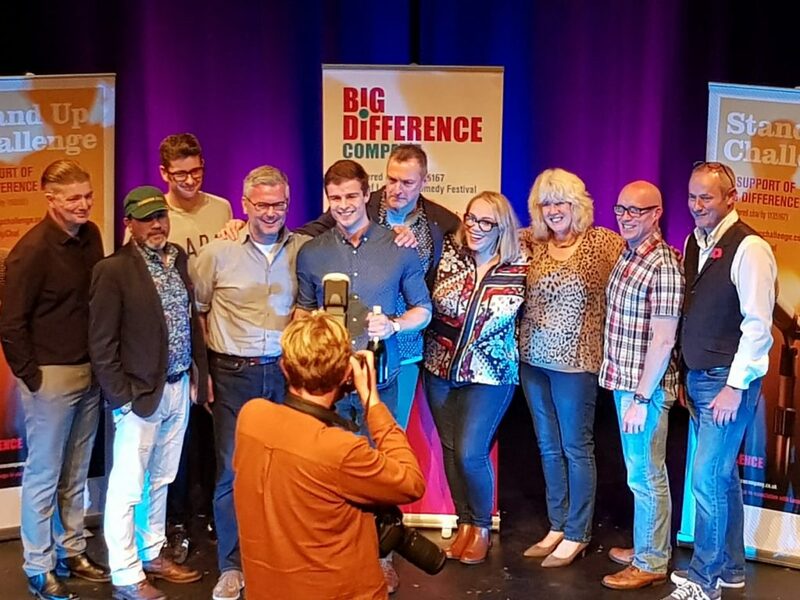 Not only was it Tim’s first time on stage, he was also awarded a very respectable third place in the Challenge by the independent judging panel. 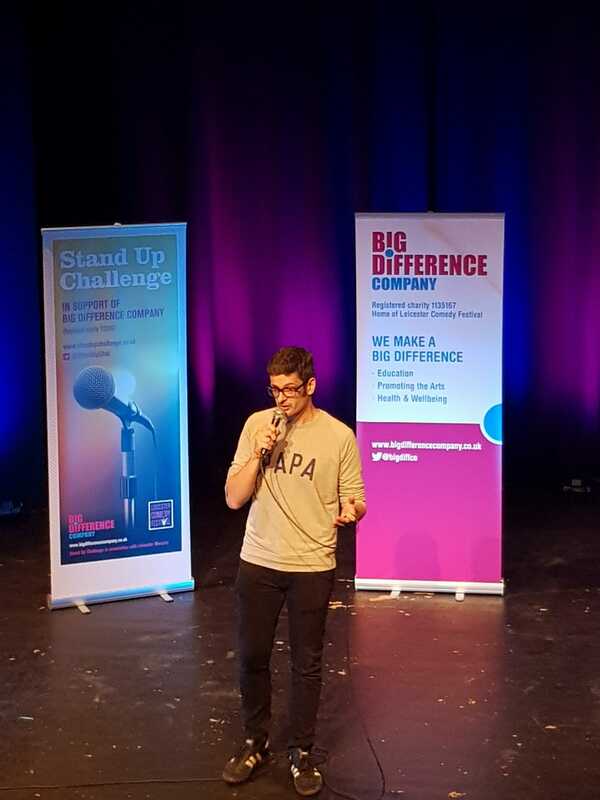 The Leicester Stand Up Challenge involves local business leaders taking to the stage to deliver five minutes of stand-up comedy to raise funds for local charity Big Difference Company, which aims to improve the health and wellbeing of communities across the UK. How did you handle your nerves on the night? I’m not a naturally nervous person; I’ve often been told I’m too laid back. Because of this the nerves only really started to kick in about an hour before the performances started. I was the fourth competitor on and I found the best way to calm my nerves was to watch the other competitors’ performances and watch Carly Smallman, the professional compere who was excellent. A glass of prosecco also helped! How did you come up with the ideas you ran through in your routine? I think comedy based on personal experience is usually the best. My routine was (very loosely) based on my experiences of parenting. I have a 3 year old daughter and a 1 year old son who take up almost all my time and attention outside of work. Whilst my work is obviously hilarious, patents and trade marks are a bit of a niche subject so jokes about work might have fallen flat in front of a more diverse audience. In contrast a lot of people are parents and everybody has been parented at some time so jokes on that subject seemed like they would be much more accessible. What do you think was your funniest joke? The joke that seemed to get the best reaction was a joke about “sleeping like a baby”. This is a ridiculous phrase because, as everybody who has ever had a baby knows, babies do not sleep well. Do you feel you have learned anything from the experience that you can apply to your day job? I’ve definitely learned the value of collaborating with an expert if you are doing something new or outside of your comfort zone. The input from Anthony King, the professional mentor, was invaluable to my routine. I’ve also learned that everybody loves a poop joke. Would you do the Leicester Stand Up Challenge again – perhaps to entertain clients? I would do it again in a heartbeat. I loved it and five minutes… or seven and a half minutes as it ended up… just wasn’t long enough. What would you say to other business people considering having a go? Do it! It was an amazing experience start to finish. I actually really enjoyed standing on a stage and hearing people laugh at the things I was saying. It might seem intimidating or nerve-wracking but the most worthwhile experiences often are. It also has the added benefit of raising money for a really worthwhile charity in the Big Difference Company. Overall, what was the entire experience like, from putting yourself forward, to meeting Anthony King, to rehearsals and then, or course, to the big night? The experience was excellent. All the other competitors were extremely supportive and there was a lovely camaraderie on the night itself. Although it was a competition nobody was overly competitive. When we rehearsed in front of each other the feedback was overwhelmingly positive and helpful. Anthony King was a great help in preparing the material itself. The night itself was really exciting and I had a real buzz coming off the stage. I loved it. You can watch Tim’s routine from the Leicester Stand Up Challenge here – feel free to send us your feedback.